Each year, exposure and accidents involving hazardous household products injure thousands of people. Because of the dangers they pose, these products require special awareness, handling, and disposal. 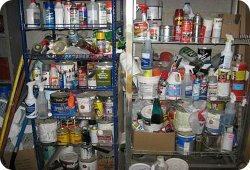 In order to protect health and the environment, every consumer should know how to properly use, store, and dispose hazardous household products. The improper disposal of hazardous waste produces a very real threat to individuals and the environment, which is why it is illegal to throw these items away in the regular trash! "Onondaga County Resource Recovery Agency (OCRRA) website"
Click here for "Registration Form"